The Ministry of Communications and Works (Department of Antiquities) announces the completion of the 2012 archaeological investigations at the Middle Bronze Age site of Alampra Mouttes in the Nicosia District of Cyprus. The Australian project is directed by archaeologist Andrew Sneddon of the University of Queensland, along with co-directors Greg Deftereos and Tom Rymer. 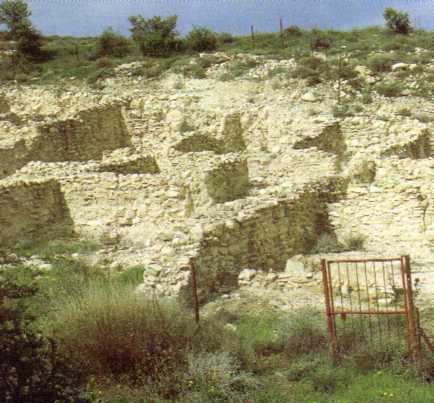 The last excavations at Alampra Mouttes were conducted in the 1980s by Cornell University under John Coleman. This season of investigations has expanded the known extent of the important Bronze Age site by discovering the remains of a c3500 year old domestic building 200-300m away from the focus of the Cornell excavation. This Middle Bronze Age house survives as a narrow rectangular room measuring some 5 x 3 metres, with low stone wall footings that once supported mud brick walls not unlike those of the traditional houses surviving in Alampra today. The house also incorporated a well-preserved storage room that contained at least six large storage vessels ('pithoi') that probably once contained such products as grain, water and olive oil. Other artefacts recovered by the team of archaeologists included a bronze pin for fastening clothing and a rare bronze chisel, in addition to implements for the weaving of textiles and ornately painted pottery. The house appears to have been destroyed by a catastrophic fire around 1600 B.C. which may explain the state of its preservation. The project was carried out on recommendation by the Department of Antiquities who were alerted to finds during road works on the outskirts of Alampra village. The University of Queensland team was warmly supported by the mayor and residents of modern Alampra and hopes to return to Cyprus in 2013 to conduct further investigations in order to expand our knowledge of this intriguing site and period.